I last posted an update on the knitted blanket I’m making back in mid July. You can easily see that and earlier posts on this project by going to the right sidebar and clicking on the knitting category. Earlier posts contain information about where I got the pattern–another blog–and how my knitting friends supplied me with their leftover yarn when I began to run out of color selections. The loose ends everywhere are either holding provisional stitches in place–they will be picked up when I do the edge–or are where I bound off the end of a block. The binding off will get woven in when I finish the edges. And I’ve adopted a practice of weaving ends in on the back as I finish each block. That way the weaving in does not seem so daunting a project. 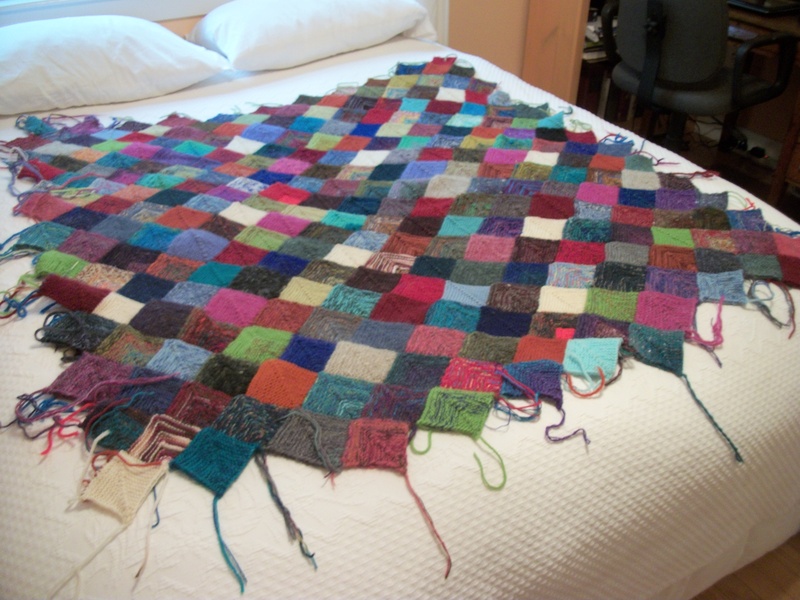 Since I started, I made the blanket wider–which is doable, but not as easy as starting it wide enough to begin with. I’m now adding another two blocks of width since when Tami (daughter-in-law) was here a few weeks ago I couldn’t work on it because she wrapped herself up in it every night. (I have a firm position that a heavy–and it is heavy–wool blanket is not appropriate for South Carolina.) Anyway, Tami thinks it should be wide enough for two people to snuggle beneath it, so I’m now making it a bit wider still. And, I’ll make it another row or two wider. Knitting master Giovanna McCarthy is going to help me decide whether or not to crochet an edge or use the straight i-cord edge the designer used. 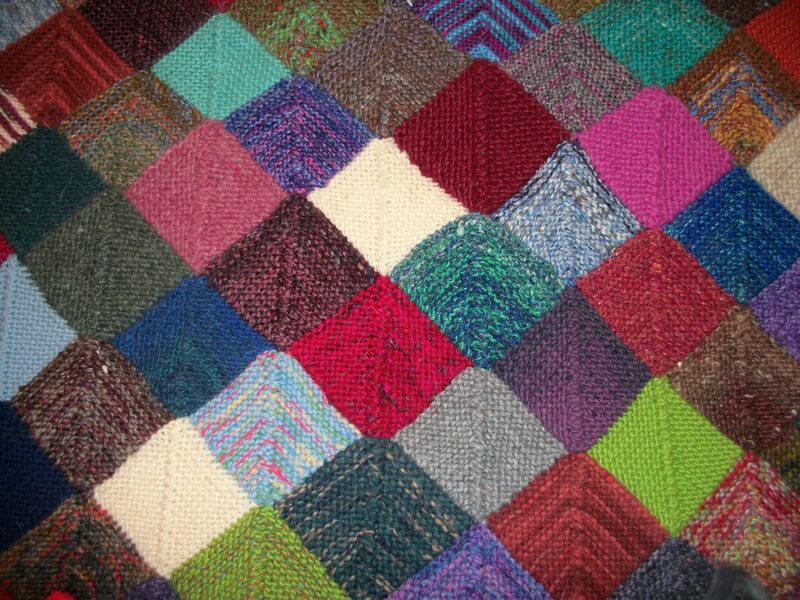 The “varigated” blocks happen when I combine several thinner yarns to make a thicker one. And the bar in the middle happens as you decrease stitches in the middle to make the diamond shape. It takes me about 40 minutes or so to make one block, but the work of it is very soothing, and I absolutely love choosing which colors will sit nicely next to other colors. I work on it at night while we watch “stories” on television (movies, tv series, etc.) I don’t think I could have watched the recent political debates (presidential, vice-presidential) without also knitting the blanket. I bet you were knitting frantically during those horrible debates. They gave me a sick stomach! LOL Your quilt is delightful…..love the colors and textures. What will you do next? Never a dull moment with you! what is the pattern you used?